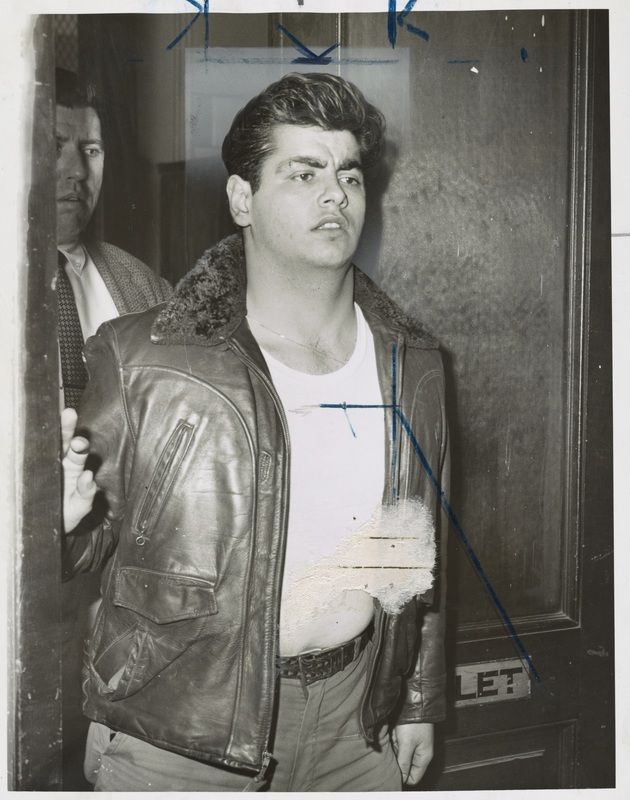 Not many gang fights and wars in New York City in the 1950s were between White gangs. Most often it was Black against Puerto Rican gangs and vice versa, which was reported on sporadically, sometimes a brief mention of it and other times reported on heavily. If the victim was White, then the newspapers went wild with hysteria. When growing up in Brooklyn, I was always intrigued by the gangs that roamed the streets and avenues of Flatbush, especially the Ditmas Dukes and the Foster Gents, except for the street designations, misnomers to be sure. I was not a gang member, but some of my child hood friends were. They thrilled at regaling me about the latest fight, the particular tactics deployed, and the battles won. Brooklyn street fighting had only one strategy. Use anything you could get your hands on–knives, zip guns, rocks, pipes, chains, bottles, and so forth–to hurt and sometimes maim members of opposing gangs. But the Categorical Imperative of Brooklyn street fighting was never to miss a chance to exploit your opponents’ vulnerability. Gang members hurt one another, and they hurt innocent bystanders, but the ultimate damage was poisoning the ambience of the neighborhood. Gangs placed otherwise enjoying activities such as playing basketball in the schoolyard, sitting on the benches of Ocean Pkway, or just hanging out–now called “chillin”–in the candy store, in an unpredictable shadow where one was never quite sure whether attacks were imminent. The threat of Brooklyn street fighting was ubiquitous. 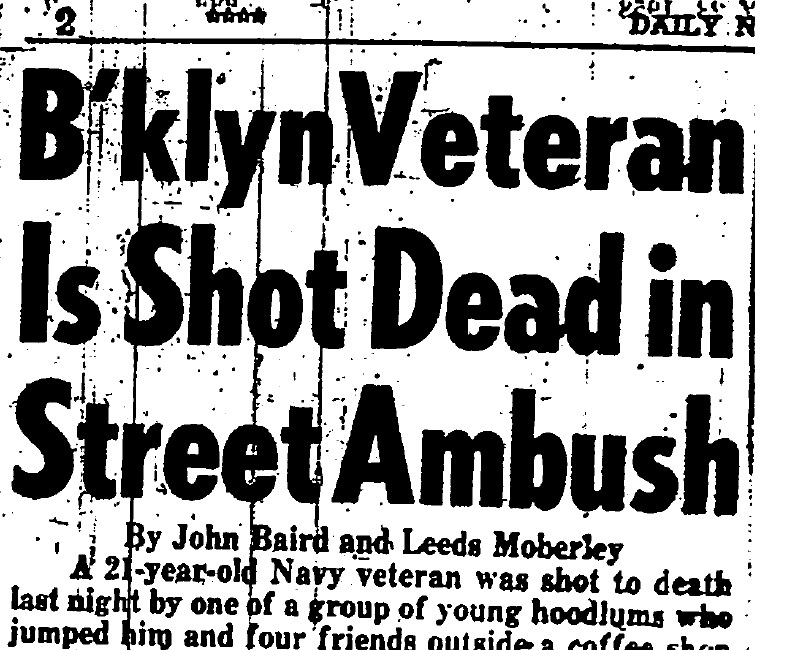 Brooklyn gangs not only fought one another. Individual gang members also bullied innocents. One developed safe routes home, and often when most relaxed hanging out with friends or getting something to eat, there they were: the gang members. When they bullied you, it was usually in packs, and they never shut up. They taunted, pushed, kicked, spit, and cursed. Their bullying would never end except when even bigger bullies attacked or threatened attack in defense of civilians or for less noble reasons. On January 27, 1958, some members of the Gremlins took matters into their own hands, stalking some Ditmas Dukes, their bitter rivals. There Robert Fasano aka “Buffalo Bob” and Salvatore Monaco aka “Little Sal” (or by another unfortunate nickname “Ugly Face,”) got in a fight with some Ditmas Dukes at Coney Island and 18th Ave., and, if his statement is to be believed, Fasano, who was carrying the gun, shot at random, hitting Louis Cuomo who had been discharged by the Navy the day before. Fasano and Sal took off, Fasano dumping the gun in Prospect Lake. Cuomo didn’t die instantly from the attack. The bullet hit him under the left arm pit and lodged near his heart. According to a newspaper article, Louis ran about 100 yards before he collapsed in front of a liquor store near a movie theatre. What movies were playing? One was called “Time Limit” and the other was “My Gun is Quick.” The police nabbed Fasano and Monaco awhile later and both were charged with murder. They both pleaded not-guilty and after a trial they were both found guilty and sentenced. To see the fingerprint cards of both Robert Fasano and Salvatore Monaco, please click on this link and go past half way down the page. Robert Fasano is no longer alive – he died of a heart attack – and as far as I understand Salvatore Monaco is also dead. I received an interesting email from Robert’s youngest brother who explained what his experiences with his brother was like as well as family dynamics of the Fasanos’ and growing up in Park Slope. 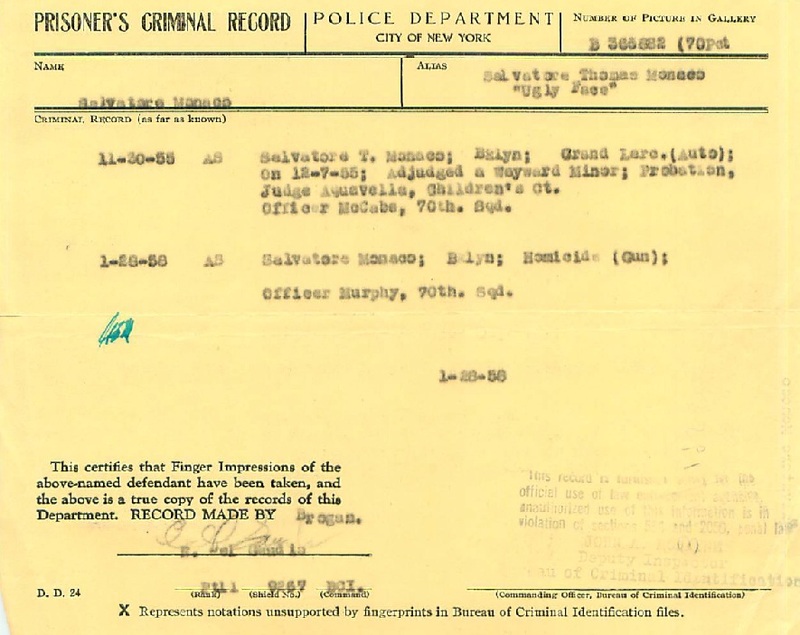 The following link is interesting not that it has anything to do with the death of Cuomo, but it is an intriguing glimpse into the life of a member of the Gremlins gang. The reference to the Gremlins is brief, but it gives a sense of the family background of a typical gang member. For another look into the family life of a member of a gang called the Python Knights in East Harlem, click here.